Chawan mushi combines two of my favorite things: custard and an element of pleasant surprise. Although the custards served to me (mostly by my grandmother) in my youth were invariably sweet, it was love at first spoonful when I had my first taste of chawan mushi in a Tokyo restaurant. On that occasion, I would have been happy just to enjoy the small ramekin of savory soupy custard that came with my meal. But when one of those spoonfuls revealed a sweet shrimp, and another a tender boiled quail egg, I was full-blown, head-over-heals gone. Japanese diners seem to think of chawan mushi more as a soup than a custard, and I have to admit that over time, I have come to prefer this dish fairly loosely set. In addition to fresh, grilled or smoked seafood (a bit of smoked salmon makes a nice finishing piece), fresh vegetables such as peas, butter beans, lotus root or mushrooms, or a tender piece of salty grilled chicken, beef or wild game all work well. Creative cooks may want to experiment with the basic dashi recipe or substitute chicken or beef broth. A pinch of smoked sea salt adds another dimension to this versatile dish which can be served hot to take the chill of a winter evening or refreshingly cold on a warm summer day. Below are the directions for Scallop and Shrimp Chawan Mushi with Smoked Quail Eggs – with much appreciation to a Japanese friend who mailed us a package of smoked quail eggs, thus inspiring this dish. By the way, chawan means tea cup; mushi means steaming. 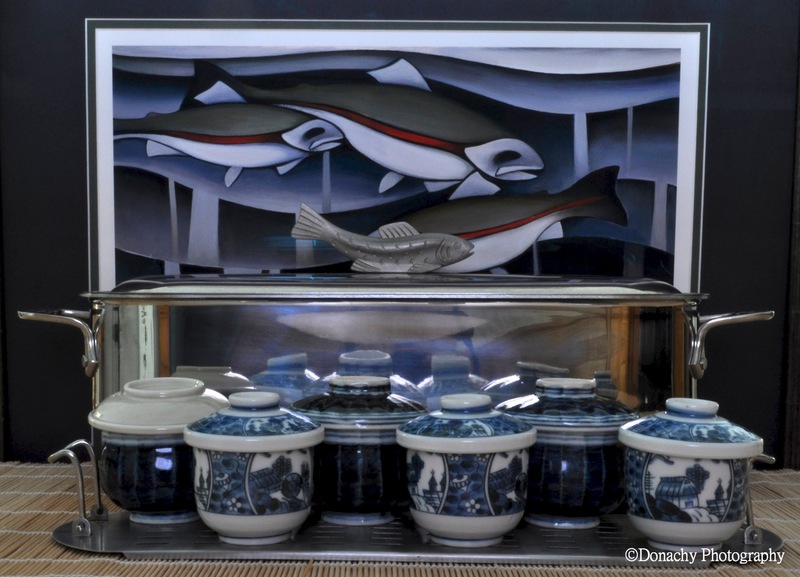 The Watercourse, a signed and numbered giclée by Whitehorse, Yukon Territory artist Nathalie Parenteau serves as the backdrop for this All-Clad poacher. With its raised tray, it’s perfect for steaming chawan mushi either in an oven or on a stove top. In the past, I’ve improvised with a large round kettle fitted with an inverted shallow wicker basket. The same kettle also works with an inverted metal strainer that happens to fit. Add two cups of water and the kombu to a pan. Heat over medium heat. Just before the water boils, remove the kombu. Turn off heat and stir in the lobster base bouillon. Strain through cheese cloth or fine-mesh strainer to remove stray pieces of kombu (or bonito flakes, if those are used). The lobster bouillon base will create a slightly darker dashi than bonito flakes. In the finished chawan mushi, this will create an attractive cream color. 6 small ramekins, preferably with loosely fitted lids. Plastic wrap with a small puncture (to allow steam to escape) can be used to cover the ramekins if lids are not available. In a bowl, whisk eggs until smooth. Make sure dashi is cool (so it won’t cook the eggs) and stir into egg mixture. Add soy sauce (and sake, optional) and mix together, but avoid mixing so vigorously that foam is created. Taste for appropriate saltiness. If more salt is desired, use sea salt. Set mixture aside. Slice scallops depth-wise into three or four parts. Place scallops and 1 shrimp each into the ramekins. If there are bubbles or foam on the egg and dashi mixture, use a spoon to remove. The finished chawan mushi should be smooth. Cover the scallops and shrimp with the egg and dashi mixture so that ramekins are about 2/3 full. Cover each ramekin with a loosely fitting lid or punctured piece of plastic wrap. Arrange the covered ramekins in a steamer and gently steam for 12 minutes, until mixture is loosely set. Turn off heat. 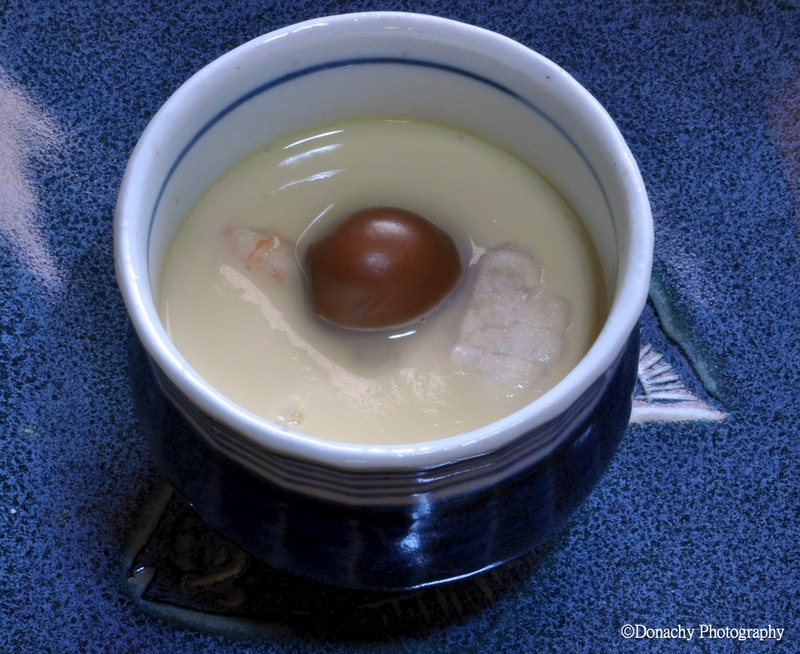 Place a smoked quail egg atop each chawan mushi, cover with lids again, and keep them in the steaming pan so that the custard continues to set and the egg warms through – approximately 3 – 5 additional minutes. This dish makes a delicious appetizer, can be served as one would serve a soup, or as part of the main meal. It will keep nicely in the refrigerator for a day or two. Our village in bush Alaska is dry, so sake is not an option. But I highly recommend you include it, as it really compliments the flavors of this dish – and pairs well as a drink served with the finished chawan mushi. 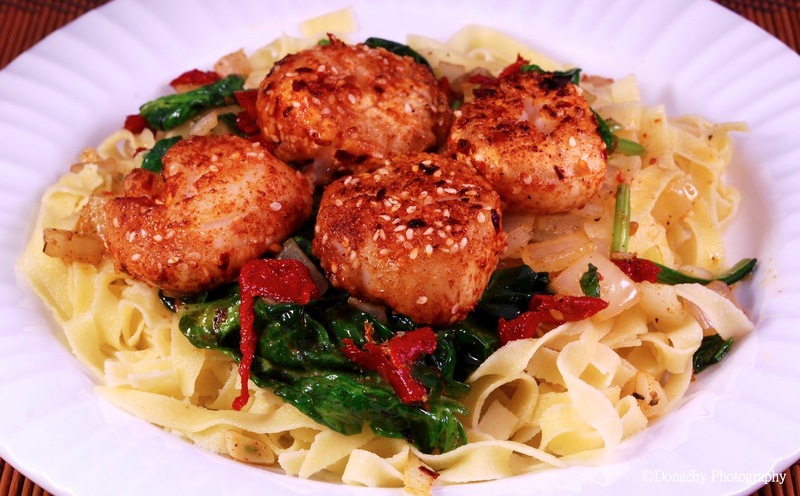 Large Alaskan scallops (from Kodiak) rolled in Thai Seasoning, pan-seared, and arranged on freshly made linguini topped with wilted spinach, sweet onion, garlic and sun-dried tomatoes. We brought five pounds of frozen scallops with us to the bush this year–and are happy to have done so! I don’t use many pre-blended spices, but a good Thai seasoning blend has long been an exception. These days I’ve been using The Spice Hunter’s Thai Seasoning, but Spice Islands Thai Seasoning is (was?) very good as well. (I’ve been unable to find it in any Anchorage grocery store.) My guess is Penzeys Bangkok Blend is at least as tasty. A little heat, a hint of sweet, Thai blends are great for spicing up squash or pumpkin soup, stir fry, or as a rub on chicken, pork, shellfish and fish. 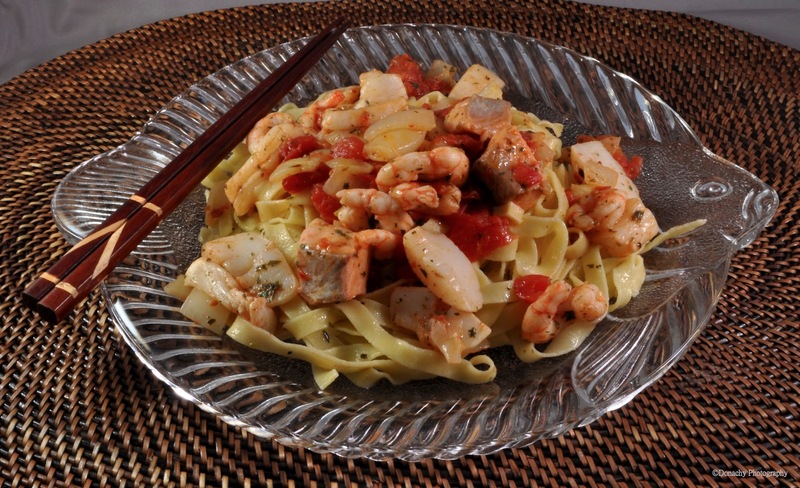 This dish is as good an excuse as I can think of to pop the cork on one of Oregon’s exquisite Pinot Gris.